Infectious Bovine Keratoconjunctivitis (IBK) or “Pinkeye” is a costly and exasperating disease for the cattle producer and industry. A field trial published in 2009 found an average weaning weight difference of 18 pounds less (range 9-27 lbs) in calves that experienced pinkeye versus those that did not. Calves with corneal scars are often discounted at sale, further increasing the economic cost of IBK to producers. 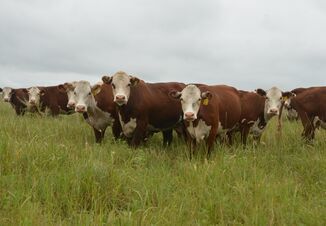 A recent study found continued impact in the beef industry from pinkeye on production traits. Yearlings that had pinkeye as young calves pre-weaning had less 12th rib fat depth, ribeye area, and body weight than did yearlings without evidence of pinkeye. Despite the well-known economic impact of disease, adequate and timely treatment of cases is challenging because cattle are grazed far away from facilities during peak occurrence in summer months. Preventing the disease has proven difficult because so many factors contribute to the development of pinkeye including environment, management, season of the year, concurrent diseases, and the animal’s genetic makeup and immune system. The bacterium Moraxella bovis is considered the primary cause of pinkeye but a newly isolated strain “Moraxella bovoculi” is now believed to play an important role. Vaccines, whether commercial or homemade, have not been found consistently effective in clinical trials. Once pinkeye begins in a herd, it is highly contagious and can spread rapidly. Careful attention to control of contributing factors, especially fly control, and prompt, effective treatment of cases are necessary to reduce the spread and limit the damaging effects of the disease. The known cause of pinkeye is the bacteria Moraxella bovis (M. bovis) which is located in the eyes and nasal cavities of infected cattle although it is not often found on bacterial culture in the lab. Moraxella bovoculi (M. bovoculi), on the other hand, is the recently described bacterium that is most frequently isolated from pinkeye cases, including cases of “winter pinkeye”. In a study published in 2014 by the University of Nebraska-Lincoln, over 600 of the 1,042 pinkeye samples tested were M. bovoculi. In nearly half (102/282) of the herds tested, both M. bovoculi and M. bovis were isolated from 1 or more animals in those herds. Because these bacteria are often found together, M. bovoculi may be an opportunist that invades and grows in eyes in conjunction with M. bovis. Both species of Moraxella bacteria have two known factors that are important for causing pinkeye: pili and cytotoxin. “Pili” are hairlike projections that enable the bacteria to stick to a damaged or injured surface of the eyeball (on the cornea). There are 7 different serogroups of pili (A through G) and vaccines are specifically formulated against these groups. “Cytotoxin” is a “poison” released by the bacteria that kills the surface cells of the cornea, creating an ulcer (Figure 1). Cytotoxin also kills the white blood cells needed to fight infection in the eye. The death of these white blood cells releases enzymes that further break down the cornea, making the ulcer even worse. Much of the current research on pinkeye is at the molecular level, analyzing the DNA of M. bovoculi to get a better understanding of how it contributes to disease and why it has proven so difficult to treat. 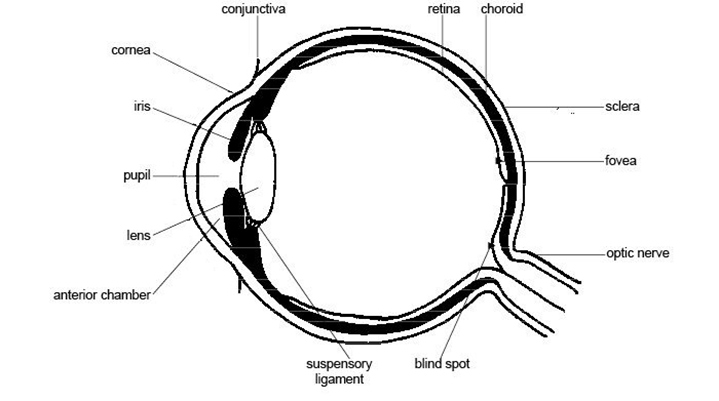 The latest studies have found the DNA (genetic makeup) of M. bovoculi from pinkeye cases to be profoundly different from those from normal eyes, suggesting there are genetically distinct strains of M. bovoculi that may not play a role in IBK. Moraxella bovoculi also shows a reduced level of susceptibility to the tetracycline class of drugs and some samples exhibit reduced response to tulathromycin (Draxxin®). The presence of “genomic islands” within M. bovoculi that may account for drug resistance is of clinical interest since oxytetracycline and tulathromycin are the only FDA approved antibiotics for treatment of IBK. Cattle are the only known reservoir of Moraxella bovis and infected carrier animals may harbor this organism year round without showing any signs of eye problems. Once pinkeye begins in a herd, it is highly contagious and can spread rapidly by direct contact through nasal and ocular discharges and by vectors, especially face flies. Prevention of pinkeye is difficult because it is a complicated, multifaceted disease. The best plan is to reduce or remove as many risk factors as possible that can result in damage to the corneal surface. 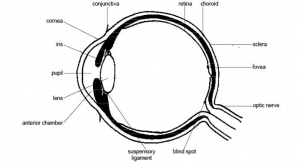 Any damage will allow the bacteria to cling to the corneal surface and grow. Many different combinations of contributing factors such as ultraviolet rays from the sun, face flies, excessive eye irritation, nutritional deficiencies, and stress may work together within a herd at one time. Prevention is based on maximizing herd immune status, controlling face flies, minimizing exposure to the bacteria, and maintaining as irritant-free environment as possible. 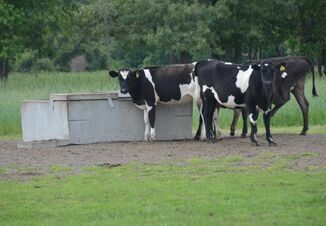 Maximize Herd Immune Status – An overall good level of nutrition, adequate vitamin and trace mineral intake, a comprehensive vaccination program including the respiratory viral diseases IBR, BVD, PI3 and BRSV, parasite control, and basic biosecurity practices are all exceptionally important in improving the cow’s or calf’s ability to fight off any disease process (not just pinkeye). There is no scientific evidence to support feeding excessive levels of any vitamin or mineral, including Vitamin A, will prevent diseases of the eye. However, if trace mineral levels (especially selenium and copper) are very low in an animal, immune function is severely impaired. In these instances, an injectable mineral (Multimin®) may be necessary to bring these minerals back within a normal range so vaccines and antibiotics can work. Biosecurity measures such as quarantine of new arrivals to the farm (including show animals) for at least 2 weeks before commingling with the herd are important in case any of these animals is carrying the disease. Control Face Flies – Face flies can play an important role in the spread of pinkeye. Their abrasive blotting mouthparts irritate the animal’s eyes, stimulating tears and mucus that feed the insects. Bacteria in the secretions of infected cattle can survive on or in face flies for 2 to 3 days and infect other animals when the flies feed again. Face flies may move as far as four miles during their life so they can easily transfer pinkeye from herd-to-herd and farm-to-farm. Face fly control is challenging. The flies spend only a few minutes at a time on or around the head, which is a difficult area to protect. Application methods that regularly place insecticide around the face and eyes provide the best means of protecting cattle. Insecticide impregnated ear tags or force used dust bags provide the most consistent reductions in fly numbers. 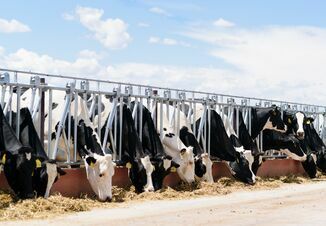 Insecticide feed throughs, such as IGRs (insect growth regulators), can reduce the number of fly maggots developing in manure of animals that receive a sufficient daily dose. However, supplemental adult control is often needed to control flies moving in from nearby herds. Read feed through product labels carefully to see if it is labeled for face fly control since some are only formulated for horn fly control. See UK Extension Publication ENT-11: Insect Control on Beef Cattle for control recommendations. Maintain an irritant free environment – Any irritation to the eye allows Moraxella organisms to invade and cause pinkeye. Prevent eye irritation with good face fly control, mow tall grass with seed heads, provide shade and ample clean, cool water, and reduce sources of stress (such as overcrowding) if possible. Provide shade to protect from the harmful UV rays of the sun. Cool, clean drinking water (instead of stagnant pond water) is critical because intake is greater with clean water and this helps provide plenty of fluid to the corneal surface, especially important in dry, dusty, and/or windy conditions. Tears are essential in eye defense mechanisms as tears wash away pathogens and tear proteins are an important component of protection. Do not forget to regularly check and clean automatic waterers. Minimize exposure to M. bovis and M. bovoculi – Early detection of animals with the first clinical signs (tearing, squinting, and blinking) and then prompt, effective treatment are essential to reducing spread to herd mates and limiting damage to the eye. Long-acting antibiotics such as long-acting tetracycline (LA-200) or the prescription antibiotic tulathromycin (Draxxin) are labeled for treatment of pinkeye. A veterinarian may prescribe the antibiotics florfenicol (Nuflor), ceftiofur (Excede), or others to be used in an off-label manner for treatment as well. Injectable antibiotics are generally the best option because of their long duration of activity and effectiveness in eliminating bacteria. Topical sprays only remain in the eye a few minutes before tears wash them away so application is generally required 3-4 times daily to be effective. When severe ulceration exists, the eyeball may need extra protection with either a patch or the eyelids may need to be sutured (stitched) together. Remember, preventing spread by treating affected animals is the single most important factor in controlling a disease outbreak. Active cases of pinkeye with excessive tearing attract flies that widely spread the bacteria. Topical application of a fly repellant to the face will also help reduce spread. Does vaccination work? – Immune responses to pili have been shown to be protective in some studies where animals are vaccinated with pili of a certain type and then challenged with a similar strain. A high degree of diversity among pilin genes is likely responsible for why some herds might see a benefit from vaccination while other herds do not; if the vaccine strain stimulates immunity to a pilus type that is also present in the herd, there should be good protection. In clinical trials, approximately half reported significant protection from commercial pinkeye vaccines. A recently published study in August of 2017 involving 214 spring-born calves, half of them vaccinated according to label directions with a commercial pinkeye vaccine and half left unvaccinated, had dismal results. At the end of the trial, pinkeye had been detected in 65 (59.1%) vaccinated calves and 62 (59.6%) unvaccinated calves during the study period and there was no difference in weaning weights for vaccinated versus unvaccinated calves. Clearly, vaccination is not the solution to all pinkeye problems although it may reduce the number of calves affected and lessen the severity of clinical signs. When commercial vaccines are not effective, an “autogenous” or homemade vaccine can be made from bacteria cultured from pinkeye cases from one particular farm or farms within a certain area. All bacterial cultures must be taken early in the course of disease; preferably when the eye is just beginning to tear excessively and before any medications are used. These specialty vaccines can be effective if the “correct” antigens are selected and used by the vaccine manufacturer. While autogenous (homemade) vaccine formulations, especially those that include M. bovoculi antigens, often are beneficial in the field, experimentally these vaccines have not demonstrated consistent results. Autogenous vaccines do lose effectiveness within one to two years as the bacteria mutate and a new batch of vaccine needs to be made from new cultures. In summary, pinkeye is one of the most common diseases of cattle and is of major economic importance to Kentucky cattle producers. Although much research is ongoing to understand this complex disease, the keys to prevention and control of pinkeye still rely on the basics of maximizing the herd’s immune status, minimizing exposure to Moraxella bacteria, face fly control and maintaining as irritant-free environment as possible. Treatment decisions are influenced by numerous factors such as effectiveness and cost of the antibiotic, labor availability, withholding times, facilities, and availability of a veterinary prescription. Vaccines are not consistently effective in disease prevention and cannot be completely relied upon to prevent pinkeye. The best strategy of treatment, prevention and control of pinkeye for a particular herd is best accomplished with the help of the local veterinarian.